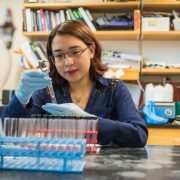 Yi Wen, graduate student in the labs of Gerald Feigenson and Volker Vogt, has been chosen as the recipient of the 2018 Harry and Samuel Mann Outstanding Graduate Student Award for her research which is aimed at containing HIV. Literally. Read more about Yi Wen’s research and award here. Copyright © 2017 Graduate Field of Biochemistry, Molecular and Cell Biology. All Rights Reserved. Site designed by Academic Web Pages. Send comments & questions about this website to the Graduate Field Coordinator at bmcb@cornell.edu.